Additional figures are on More Figures page. In this graph the base period is switched from our traditional 1951-1980 to 1880-1920 for the reasons given in "A Better Graph", but of course we continue to also produce our graphs with the 1951-1980 base period, as shown below. (Figure also in PDF Data through March 2019 are used for computing the means. last modified 2019/04/15, now with GHCN version 3.3.0 and ERSST v5.) Similar graph but only for the US 48 states. PDF. Below are maps of the mean surface temperature anomaly for the past month, the past three months, and the past 12 months. Regional weather patterns, apparent on the monthly time scale, tend to disappear in averages over longer time scales. In the chart in the lower right we show the 2013-2018 global land-ocean temperature anomalies. Also in PDF, last modified 2019/04/15, now with GHCN version 3.3.0 and ERSST v5. 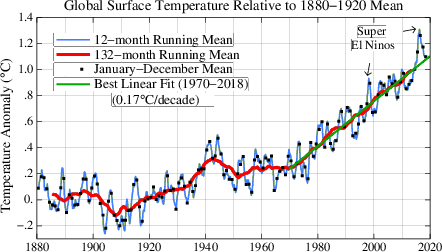 (a) Our traditional graph of the annual and 5-year running means of the global temperature, and (b) 12-month and 132-month (to minimize the effect of the 11-year solar cycle) running means on the right. Also in PDF. Information in detail with tables and the original data sources are on NASA GISS temperature web pages. 2015/06/13: from GHCN v3.2.2 to v3.3.0. 2013/01/15: from HadISST1 + OI SST to ERSST. 2015/07/19: from ERSST v3b to ERSST v4. 2017/08/15: from ERSST v4 to ERSST v5. For more details, please see GISS Updates page.